At Frank's Fire Extinguisher Service, we are proud to provide residential, commercial, and industrial clients throughout Los Angeles with the best value in fire extinguisher sales. Over the last 16 years, we've sold and delivered high-quality, reliable fire extinguishers at very competitive rates to thousands of satisfied customers throughout Torrance, Compton, Carson, Long Beach, Rancho Dominguez, Los Angeles, Beverly Hills, Culver City, Westwood, Santa Monica, and surrounding areas. We're family owned and operated, locally based, and knowledgeable in all types of extinguishers and their applications. All of the fire extinguishers we sell are made by Amerex. Based upon our personal experience of more than 39 years, we believe Amerex to be one of the best extinguishers on the market. They offer an extensive array of innovative, high-quality fire extinguishers, including ABC multi-purpose dry chemical, water, water mist, carbon dioxide gas, wheeled, and foam extinguishers. You can tell us what fire extinguisher type and model you want to order, or we can provide you with product recommendations based upon your specific needs. Amerex hand-portable extinguishers are available in a wide range of sizes, including 2.5 lb, 5 lb, 10 lb, 15 lb, and 20 lb. The 2.5-pound fire extinguisher is ideal for homes and cars, while the larger sizes--which are more powerful--can be used for a variety of commercial and industrial applications. Amerex also manufacturers wheeled extinguishers that vary in size from 50 to 250 pounds, which we sell and deliver. Wheeled extinguishers are mainly used at airports, refineries, and any other location with big tanks of fuel or other flammables. Amerex fire extinguishers meet current building and fire code regulations and are backed by a six-year warranty. Call Frank's Fire Extinguisher Service today for all of your fire extinguisher needs. We're fully licensed and insured, and also a member of CALSAFE. 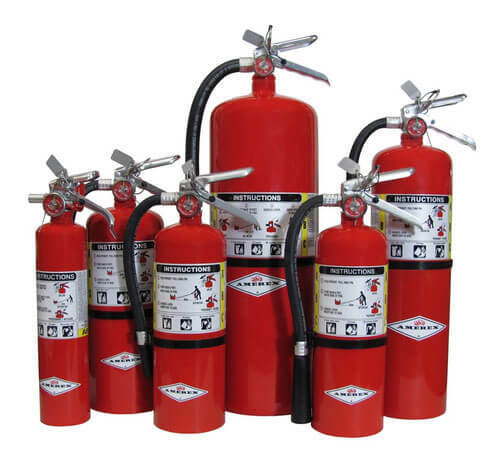 We have all classes of fire extinguishers to meet the needs of homes, apartments, condominiums, offices, restaurants, banks, airlines, car dealerships, storage facilities, warehouses, manufacturing facilities, cars, boats, trucks (including propane trucks, gas tankers, and commercial rigs), forklifts, and more. We can also service, repair, and recharge most major brands of fire extinguishers, and sell metal and fiberglass cabinets for the safe storage of your fire extinguisher. We provide onsite consultations. Call us to schedule your appointment. I live about 2000 miles away in Georgia and haven't used Franks Fire Extinguisher Services, but know him as a friend and a man who loves his family and loves God. He has always spoken of his business with pride in the fact that he offers his customers conscientious service and at an affordable price.